Our goal was to create an automated assistant to help event organisers answer enquiries 24/7 whilst still providing an easy way to contact event organisers if necessary. The Bot Forge offered a great service to us for the Saddleback Fred Whitton Challenge, that was really helpful for our customers and customer service team alike! They created a Facebook Chatbot based on the FAQs on the event website, which developed over time as more questions came up. Not only did this take some weight off our team and enhance customer experience, it has also allowed us to better understand what information our riders are seeking, so that we can better answer their questions proactively through the website and social media. Adrian is always available at the drop of a hat, and eager to provide helpful solutions and developments. 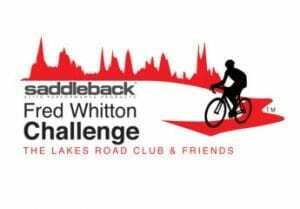 The Fred Whitton Challenge consists of a 112 mile charity sportive around the Lake District. As the name suggests, it is run in honour of Fred Whitton. Fred, who died aged just 50 in 1998, was an extremely popular member of the Lakes Road Club. Renowned for being one of the most difficult sportives it is an extremely popular event with over 2000 participants and is oversubscribed each year. We wanted to create a chatbot which could assist the event organisers in answering ride enquiries and reduce the amount of time they take in answering routine questions on their facebook messenger page. Our aim was to create a bot which could answer questions and provide event information 24/7. We also wanted to provide the ability for users to look up their time for this year and previous years. Human Race and the Fred Whitton organisers were keen to still make it easy for participants to message organisers directly through the bot if they wanted to contact a real person directly. We looked at FAQ data provided by the Fred Whitton steering committee and historical questions to their facebook page. Using this information we were able to create the conversational scripts and then implement the conversation ability. You can read more about how we run our chatbot projects here. We also built in the integration with existing ride data so users can look up results from up to the very first year of the event. 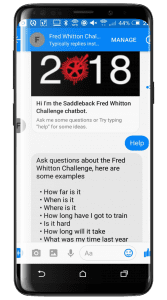 The automated event assistant chatbot we created is integrated within the “Facebook Messenger app” of the Fred Whitton page and users can contact it through the private “Messages” feature of their page, or directly through the Messenger App. It provides 24/7 access to event information by answering any questions immediately using our Natural Language Processing engine. It can currently handle 90+ intents (An intent represents a mapping between what a user says and what action should be taken by the bot). The bot has 9 unique entity types (Entities are powerful tools used for extracting parameter values from natural language inputs). Enquiry fulfillment integrates with external data at 9 different points to provide the correct information. It is able to guide entrants, without wasting time on searching and browsing through websites or apps. The bot uses AI to become smarter so it can provide the relevant information. Utilising rich UI elements in Facebook Messenger to provide the perfect experience for Fred Whitton participants. The bot also allows users to look up past event times if they have participated previously and check weather reports and look up event facts and tips as well as vital on the day safety information.